Fresh from his 1941 hit The Lady Eve, Preston Sturges drew partially from his own life for his next film, The Palm Beach Story (1942). His ex-wife was an heiress that traveled among European aristocracy and was even courted by Prince Jerome Rospigliosi-Gioeni. As a young man, Sturges traveled back and forth between Europe and America. He came up with a story entitled, Is Marriage Necessary?, which was also the working title for the film (along with Is This Bad? ), but after censors got done with the script, changes were made, including the title, which became The Palm Beach Story. Tom (McCrea) and Gerry (Colbert) are a Park Avenue couple having trouble making ends meet. The opening credits hint a whirlwind wedding with plenty of zany antics. A wealthy aging sausage tycoon gives Gerry $700 to pay the rent, which doesn’t sit well with Tom when she recounts the story to him later that day. “Everybody’s a flop until they’re a success,” he tells her, but this isn’t very reassuring. Gerry’s tired of being in debt and blames herself for their lot in life. The next morning, she tries to leave in a sequence that demonstrates Joel McCrea’s screwball comedy credentials as Tom gets tangled up in bed sheets while Gerry attempts to exit their apartment building. They continue to argue outside the building and into the train station until she gets a cop to detain him while she hops a train to Palm Beach thanks to a group of millionaires. She plans to get a divorce and then marry a rich man in order to help fund one of Tom’s dream projects. Naturally, he pursues her and gets mixed up in one of her hare-brained schemes. Much hilarity ensues. Claudette Colbert and McCrea were that rare breed of actors that excelled at screwball comedies. They were able to handle high volumes of dialogue and deliver it at a rapid-fire rate. While her forte was verbal sparring, he had a knack for physical comedy. Together, they made for quite a team as The Palm Beach Story ample demonstrates. Sturges’ film affectionately pokes fun at the idle rich as he said in his autobiography, “Millionaires are funny.” At the time, it came as a welcome relief from the glut of World War II movies but now it stands as a timeless comedic masterpiece. This Blu-Ray is a significant improvement over the DVD version with more information contained in the frame and superior texture that really brings out the filmic qualities of the image. 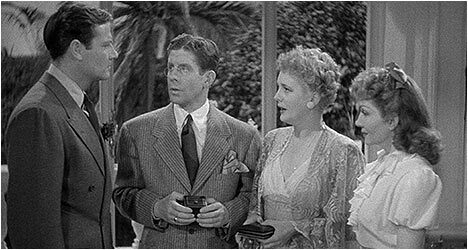 There is a 17-minute interview with writer/film historian James Harvey about Sturges’ life and career with the focus on the genesis of The Palm Beach Story and its place in the screwball comedy genre. Actor and comedian Bill Hader offers his two cents on Sturges, including how the narrative of The Palm Beach Story works, the pacing of the script and the unusual finale. Hader is an engaging presence and quite knowledgeable about the film and Sturges. Also included is a radio adaptation of the film featuring Colbert and Rudy Vallee reprising their roles. Finally, there is “Safeguarding Military Information,” a semi-documentary short film written by Sturges that promotes the notion of military men being alert at all times.